According to the legend, when Buddha reached enlightenment he invited all the animals to celebrate their joy. To that invitation only 12 animals came; the Pig was one of them and they were included, from that moment onwards, in the Chinese Horoscope. How do I know if I am a Pig? As we have indicated before, each animal ‘governs’ a specific year. 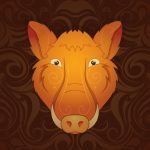 The years of the Pig in the Chinese Horoscope are: 1911, 1923, 1935, 1947, 1959, 1971, 1983, 1995, 2007… and so on, adding 12 years to the previous figure. In the Chinese Horoscope, the Pig is known as one of the signs that most appreciates the pleasures of life. They usually feel comfortable in situations where no one else could feel, emotionally speaking. They tend to be good people who like to live a quiet and peaceful life. Lust for life: it is the sign of the Chinese Horoscope that most enjoys the small pleasures of life. Selfish: in general, the Pig is quite obsessed with himself and easily forgets the needs of others. Somewhat insecure: they are excellent workers but, sometimes, they do not believe in their own abilities; with the right leader they can develop all their talent but first they need a good dose of self-confidence. Good advisers: Pigs have common sense and the rest of the people seek their advice, which is generally good. When those born under this sign of the Chinese Horoscope have the water element, they are self-indulgent people who need an extra stimulus to overcome laziness. They are naturally charming. Under the influence of the element wood, Pigs tend to develop their wisdom and ambition. Under the fire element, this sign of the Chinese Horoscope is brave and adventurous. Friend of the risks and challenges. Under the influence of the element earth, Pigs are more insecure and prudent. They are very fun and sociable. They cannot stand spending much time in the same place.